What is Le Chatelier’s principle? 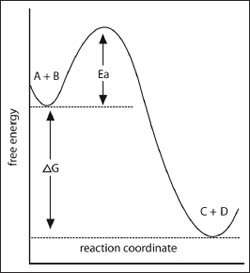 If we decrease the concentration of A, some C and D will react to replenish the A that is depleted, so the concentrations of C and D will decrease. As species A is replenished, more B will be created as well. So the net effect is that decreasing the concentration of A will also decrease the concentrations of C and D, and at the same time increase the concentration of B. More generally, decreasing the concentration of a reactant will cause the equilibrium to shift toward the reactants, increasing the concentrations of other reactants and decreasing the concentrations of products. The converse is also true: Decreasing the concentration of a product will cause the equilibrium to shift toward the products, increasing the concentrations of other products and decreasing the concentrations of reactants. It is important to keep in mind that Le Chatelier’s principle only applies to reversible chemical processes (chemical equilibria), so everything we have said here does not apply to reactions that can only proceed in the forward direction. An example of a free energy diagram.